We are pleased to announce that Pan! Our Music Odyssey will be opening at cinemas across the country on November 5th, 2014. You can see Pan! 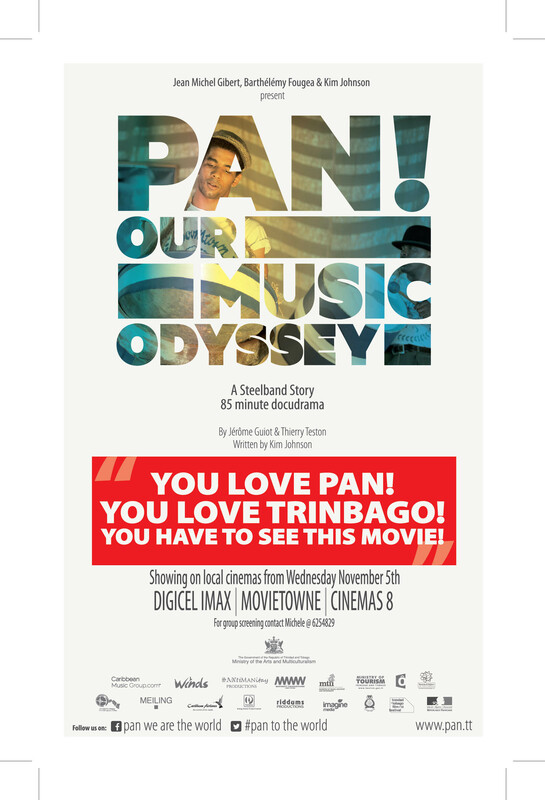 Our Music Odyssey at Cinemas 8, Movie Towne and at Digicel IMAX Port of Spain. This is an exciting moment for local movies and we are inviting you to come out and show full support not just for our national instrument but also for our growing local film industry. This docu-drama is a feel good moment for all of us as Trinbagonians, a positive tale to remind us we can create beauty out of adversity. Steelpan is Trinidad and Tobago’s gift to the world and Pan! Our Music Odyssey captures some of the passion that went into its creation 70 years ago. Mark it in your calendars and don’t miss out on this chance to support local movies, music and performers!